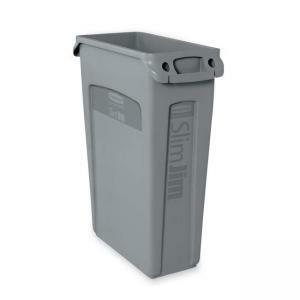 Slim Jim Waste Container offers an easy way to remove and replace can liners. Venting channels reduce force required to lift full can liners up to 68 percent. Molded-in pull-thru holes with can liner "cinch" hold liner in place. Integrated molded-in base grips provide additional control when lifting or dumping. Side handles make handling easy while maintaining a small footprint.